Hands on with the Nintendo Wii U Jump to media player Daniel Emery tries out the latest Nintendo console, the Wii U, at the Eurogamer Expo games showcase event in London. Xbox head forecasts console future Jump to media player Microsoft has announced it will introduce live television to the US and a new Halo game as part of its future strategy of the Xbox 360 console. 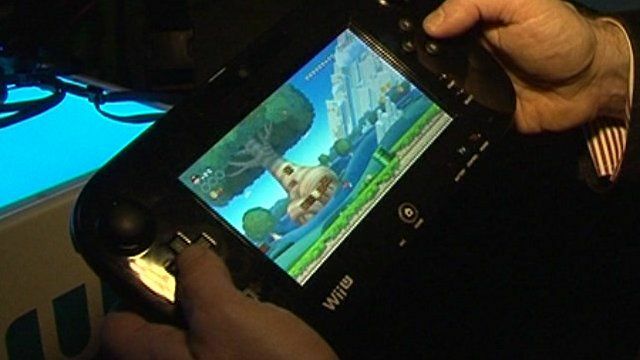 Nintendo has shown off its latest console, the Wii U, to the UK public for the first time. The games company unveiled it at the Eurogamer Expo in Earl's Court, London, a four day showcase event for the gaming industry which runs until 30 September. Nintendo announced that the Wii U will be available in shops in Europe from 30 November, in time for Christmas sales. Daniel Emery tested it out, and asked Shelly Pearce of Nintendo UK what will make this console stand out in a competitive market.